Product prices and availability are accurate as of 2019-04-16 02:27:48 MDT and are subject to change. Any price and availability information displayed on http://www.amazon.com/ at the time of purchase will apply to the purchase of this product. Be prepared for anything on your next outdoor adventure with the Rothco 3235 Adventurer Survival Kit Knife, which comes with everything you need to make the most of your surroundings. 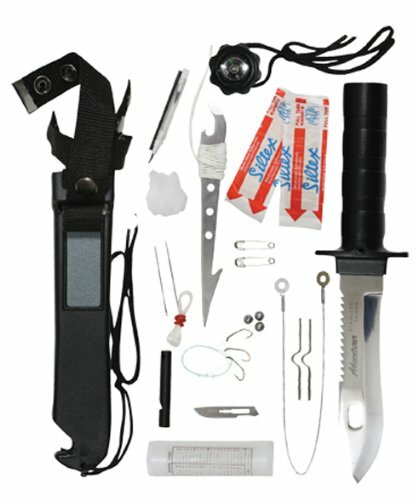 The knife is 10.5 inches long, and the hollow handle contains a fish line, hook, sinkers, bandages, small harpoon, signal mirror, finger tip saw, pencil, and more. 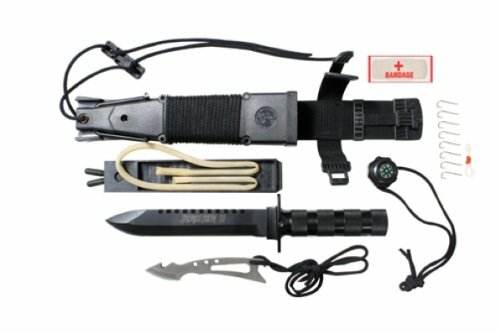 The blade is 5.25 inches long, and slides into the included accessory sheath, which additionally has a peg for use as a wire-cutter. The handle's screw-off top has a compass, as well, and helps keep all of the valuable contents dry. Quality tested and ensured for maximum durability Designed with only the toughest, roughest users in mind Comfort and performance come hand in hand with rothco Be prepared for anything on your next outdoor adventure with this survival knife Kit has everything you need to make the most of your surroundings Knife is 10.5 inches long; hollow handle contains fish line, hook, sinkers, bandages, small harpoon, signal mirror, finger tip saw, pencil, and more Blade is 5.25 inches long, and slides into included accessory sheath, which has peg for use as wire-cutter Handle's screw-off top has compass, and helps keep contents dry; note matches not included,The product does not include a sling shot.